The Southern Arizona Chess Association sponsored the 2011 Tucson Open at the Holiday Inn Palo Verde this past weekend. 129 chess players participated in three sections: Open (51), Reserve (40), and Booster (38). In addition, two separate one-day tournaments with two sections for players rated below 1000 were held on Saturday and Sunday. My record of one win and two draws in the Open section was offset by losses to two opponents who finished tied for 2nd place. Dipro Chakraborty, currently ranked number 8th in the U.S. of all 15 year olds and 21st of all active Arizona players, was the only player to win his first four games. He lost in the last round to tournament winner International Master Levon Altounian who finished with four wins and one draw. My other loss was to International Master Dionisio Aldama who is currently the 5th highest rated active player in Arizona and whose highest U. S. Chess Federation rating was 2537. He is the highest rated chess player I’ve ever played over-the-board. My only win came against 11 year old Xiexin Wang who has already played in more chess tournaments than I have played in since 1991 and is currently ranked 62nd in the U.S. for his age. This morning we drove up South Mountain to the Buena Vista parking lot and hiked 1.75 miles to Hidden Valley and then returned on this relatively flat part of the trail. Near the start of this part of the National Trail, as the name Buena Vista implies, there are some nice views of Phoenix. On our way to Hidden Valley we passed a mountain biker straightening his tire after taking a fall negotiating steep jagged rocks. At this same spot on our way out we observed another mountain biker literally brake his chain. Mountain biking is not for the faint of heart. 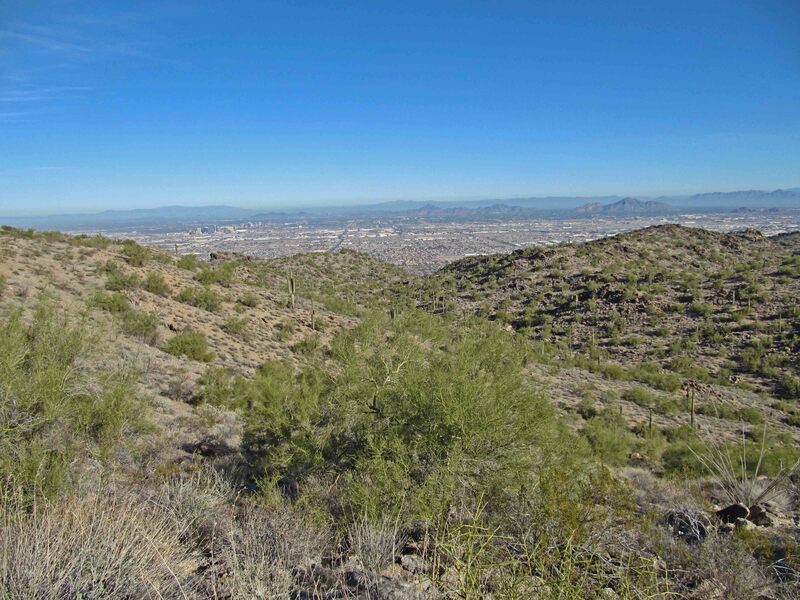 Next Saturday South Mountain hosts the 15.5 mile National Trail Trek for pre-registered participants. P. F. Chang’s Rock’n’Roll Arizona Get Fit Challenge made it very difficult to visit the Phoenix Zoo yesterday. Many of the roads that normally lead to the zoo were blocked for the safety of the 2,315 participants in this marathon and 1/2 marathon. Shortly after we finally found a way to the Zoo, we ate our lunch in an enclosed aviary. The marked lapwings would sip water and walk on the sidewalk near one of the entrance gates until the next group of visitors would pass through. 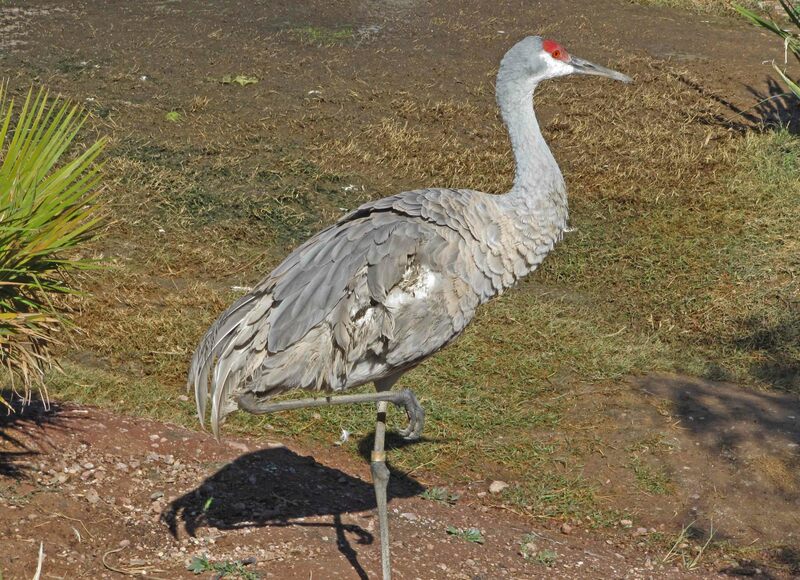 A sandhill crane preened itself near a pond with American white pelicans and other waterfowl. In a secluded forest like area, a colorful scarlet macaw was busy preening itself, too. Cowbirds weren’t on exhibit but were looking for handouts. Arabian oryx and desert big horn sheep were feeding. Construction is underway on the orangutan exhibit which is expected to open in April.